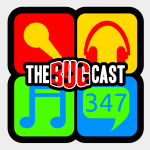 This week on The Bugcast: we talk about mobile messaging, cover versions, and we play our usual mix of 8 great tracks of Creative Commons music! Podcast Awards 2015 – nominations are open until Friday 6 February! The clock is ticking for you to submit your choices for episode 350, which will be recorded live on Friday 27 February, let us know what your favourite tracks are from episode 303 to now! Suggest or contact us by Friday 20 February! The next live show will be episode 348, which will be broadcast live in the chatroom on Friday 13 January 2015 at 21:30 UK time (GMT/UTC).